Over 80 of Howe Green’s 7500 Series Medium Duty Stainless Steel Floor Access Covers were specified by architect Chapman Taylor LLP for the Westgate Oxford development. The floor covers provide access to essential services concealed under the flooring. Laing O’Rourke began construction of the 800,000sq ft centre in spring 2015. The centre will eventually have over 100 stores, 25 restaurants and cafes, a 5 screen boutique cinema and a public roof garden complete with cocktail bar. The Howe Green 7500 Series Floor Access Covers provide safe, easy access to underfloor services and high levels of performance for what will be a heavily trafficked pedestrian area. The 7500 Series can withstand up to a 5 tonne pneumatic wheel loading and, as they are made of stainless steel, are resistant to rust and corrosion. 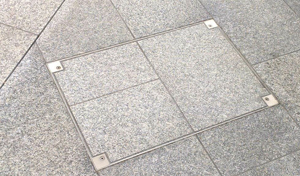 The covers, installed by specialist stone contractor Vetter UK, have been infilled with various types of stone to blend seamlessly with the different hard flooring finishes used across multiple locations. The flush finish ensures the attractiveness of the flooring is not compromised and the risk of slip and trip hazards is reduced. The 7500 Series Medium Duty Floor Access Covers are tamper resistant, meeting the requirement for a secure access solution, a necessity in such a public place. This entry was posted in News and tagged Building, Construction. Bookmark the permalink.